You're always a VIP at Club Vegas! Enjoy hours of fast-paced fun with a variety of blackjack games. 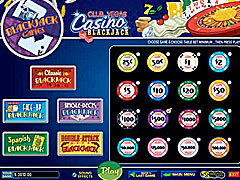 Try your luck at Classic Blackjack, Spanish Blackjack, Double Attack Blackjack®, Single Blackjack and Face-Up Blackjack, each with different payouts and odds. 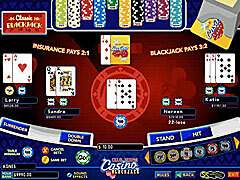 Club Vegas Blackjack features stunning graphics, easy controls and a cool casino ambience. 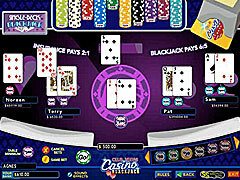 Hone your skills on 5 Blackjack Games!Classic offers an entertaining combination of luck and skill. Face-Up adds an extra twist of strategy with two face-up dealer cards. Blackjack returns to its roots with Single Deck Blackjack. The special Spanish deck changes the odds and ramps up the fun. Raise the stakes even higher with a bust bonus side bet in Double Attack Blackjack®! Double your original wager, or place a bust bet on the dealer's hand. It's a high-tension casino favorite.